On Saturday, NASA astronauts Butch Wilmore and Terry Virts completed the first of three spacewalks preparing the International Space Station for two new docking adapters. The International Docking Adapters, or IDAs, are standardized to link up with a variety of spacecraft including SpaceX’s crewed Dragon and the Boeing CST-100. The IDAs won’t ship to space until later this year aboard two Dragon cargo flights. Before the new hardware can be installed, additional power and data cables must be strung across the station’s hull—a job that fell to Wilmore and Virts. In essence, the two astronauts became typical neighborhood cable technicians—except for the fact that they were wearing space suits. This cool timelapse created by Trent Faust condenses Saturday’s six-hour, 41-minute spacewalk into an eight-minute video. Faust intersperses sped-up NASA TV footage with a 3D overview of the spacewalk given by lead EVA officer Karina Eversley. The longest portion of the cables installed by Wilmore and Virts snake from the station’s Destiny laboratory across the Harmony node. Harmony is the station’s forward-facing junction that connects to Destiny, Kibo and Columbus. Harmony also has forward, nadir (Earth-facing) and zenith (star-facing) hatches. Harmony’s forward hatch is connected to Pressurized Mating Adapter 2, or PMA-2. PMAs are used to form small, conical tunnels between spacecraft and station components. The space shuttle docked to PMA-2 near the end of the program. Another PMA, PMA-3, is currently installed on the complex's Tranquility node. NASA will soon relocate PMA-3 to Harmony’s zenith hatch, giving Harmony two PMAs 90 degrees apart. 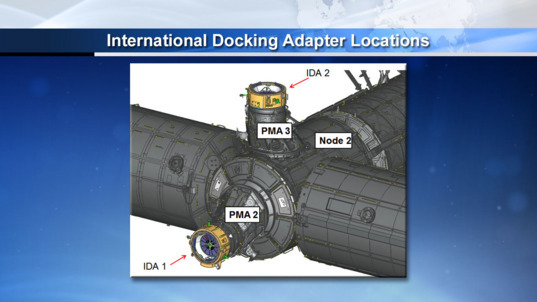 The new International Docking Adapters will be attached to the Harmony PMAs. SpaceX’s crewed Dragon and Boeing's CST-100 will be equipped with their own IDAs, allowing them to dock at Harmony. Having two docking ports gives NASA a backup in case a spacecraft is unable to dock due to a technical glitch. Unlike berthing ports, which are currently used by visiting cargo vehicles, docking ports can be sealed quickly in the event of a crew evacuation station. 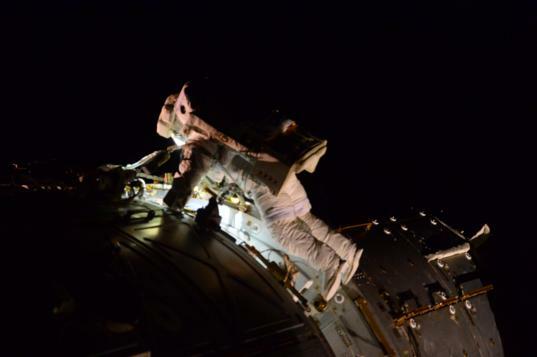 Wilmore and Virts will embark on a second spacewalk this Wednesday, and a third on March 1.